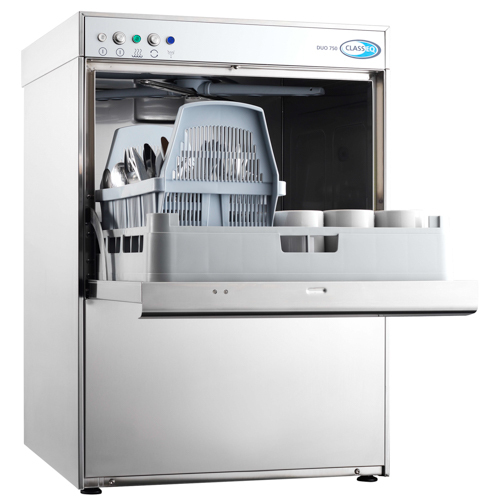 The Classeq Duo 750 Front Loading dishwasher is a great choice 500mm basket size under counter dishwasher, washing up to 750 dishes per hour with a power supply of 6.84KW. With removable rack guides to allow for easy cleaning and simple service access. Complete with Drain pump, rinse pump and WRAS approved Air gap for simple and compliant installation. Classeq have also supplied an option for an integral water softener the Classeq Duo 750WS. Click on a document to download. Elite offer a comprehensive installation and site survey package on all Classeq products. Please call us on 01923 236 238 for more details. All Classeq Duo models come with a 2 year parts and labour warranty as standard. Additional warranty is available.Please call us on 01923 236 238 for details . Terms and Conditions apply. Delivery in England and Wales. Orders have a normal delivery time from 1 – 5 working days.